Thank you to everyone who participated in Count me In. Stay tuned for more North York community focus groups with NYA. 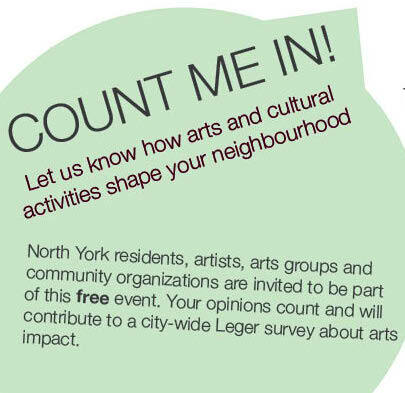 North York residents, artists, arts and community groups tell us how arts and cultural activities are shaping your neighbourhood. Your opinions count and will contribute to a city-wide survey about arts impact. Event is FREE. Register at info@northyorkarts.org by January 26. Please put Focus Group #2 in the subject line.